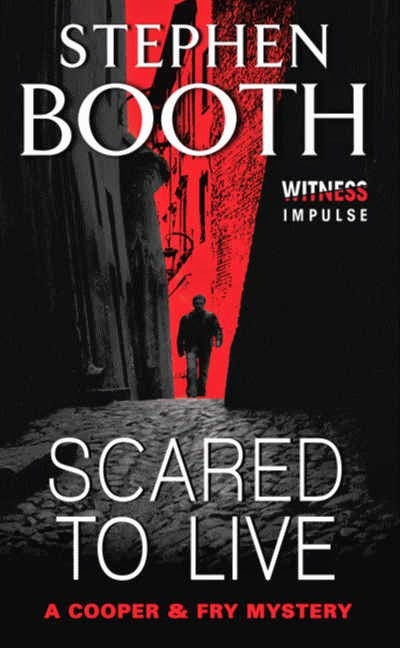 Scared to Live is the seventh book in the Ben Cooper and Diane Fry series by English crime writer Stephen Booth. Scared to Live is a memorable book and for the first time in a long time, I find I'm totally obsessed with a series. Rose had always known she’d be killed. Well, it felt like always. She could barely remember a time before she’d known. She expected to meet her death because of the way she’d led her life. It was a question of when it would happen, and how. All she could hope for was that it would be sudden, and painless. (...) In some ways, knowing her fate only made things worse. It meant that she lived every day in fear. (...) For a long time now, she'd considered it more difficult to live than to die. Summary: How do you investigate the murder of a woman without a life? That's the challenge facing Detective Constable Ben Cooper and Detective Sergeant Diane Fry when a reclusive agoraphobic is found shot to death in her home. For a woman with no friends, no family, and virtually no contact with the world, someone took an exceptional amount of care executing her murder. At nearly the same moment, a raging house fire claims the life of a young mother and two of her children. But troubling questions remain in the ashes. Among them, how did the fire start and where was the husband at two A.M.? As the two cases begin to converge, a horrific possibility takes shape. A killer is stalking the Peak District whose motives are a mystery and whose methods are unpredictable. And his next victims could be the only two cops who can stop him. My thoughts: I'll begin with all the things I've said before. You can start reading the series with this book, but I really think you should first get to know the characters through the first book, Black Dog. Scared to Live is not really fast paced, but it is definitely thrilling. There are twists and turns and unexpected outcomes, but they are not all there is. The book is set in the fictional Peak District town of Edendale and are filled with picturesque descriptions of the countryside. It revolves around the lives of two Derbyshire detectives, Ben Cooper and Diane Fry. The reason I say lives is that the book does not feature a single investigation. There are multiple cases, multiple solutions and long glimpses into their personal lives, interactions and opinions. That is not to say that the author doesn't manage to neatly tie it all up together at the end. For me, Scared to Live and the other books in the series are almost genre-defying and rarely as riddled with stereotypes as most small town crime fiction (the "cozies" as they're called.) They feel complete. In Scared to Live, Cooper takes on the carefully executed murder of a mysterious woman, Rose Shepherd, who seems to have no life or connection with the rest of the world, while Diane Fry struggles with the investigation of the fire, convinced that the husband started the house fire that killed his wife and daughters. However, neither case leads anywhere, until they find the thing that connects the two. The missing child of the victims of the house fire is discovered to be adopted and the family is supposed to have met the other victim, the loner, Rose Shepherd. Ben Cooper is an altogether likable character. He is the one everyone's fond of, the son of a policeman, grown up on a farm and is pretty much the go-to guy when it comes to local information. He has 'instincts', few qualms about breaking rules when following his intuition, he empathizes with the victims and gets attached too easily. But for all his outgoing, warm helpfulness, he is kind of naive, which of course only makes him cuter. Diane Fry is the exact opposite. At first glance, I suppose she'd be an intimidating, stern person you'd hesitate to go up to. She is a city-girl stuck in the countryside, desperate to get out and reluctant to form any bonds. And she has a past that brought her to Edendale from Birmingham. Unlike Cooper, Diane has no family to speak of, having been in foster care, no friends and a very go-by-the-book attitude. You don't find her expressing any feelings other than a sort of derisive sarcasm, and you find it very difficult to sympathize with her. She also shares a history with Cooper that you'd want to read Black Dog to know. It's the complex tension between Cooper and Fry that makes these novels as engaging as they are. They often misunderstand, disagree with and infuriate each other. And no, they don't end up together (haven't yet, anyway) nor do you want them to - most people end up hating Fry, although I kind of like her for being the gritty outsider that she is, not all characters can be perfect saints. In Scared to Live, though, we get to see a more human side of Fry, she has an almost crush, though not quite. She begins to care about the surviving daughter of the victims of the suspicious house fire, the girl who turns out to have a similar past as Fry herself. Ben Cooper's personal life features less in this book, we know he's dating scene-of-crime-officer Liz Petty. Although, I was considerably haunted by his brother Matt's worry that his daughter might have a genetic inclination to schizophrenia because of their mother. The best thing about Scared to Live is the international turn it takes. Saying any more, in my opinion, would ruin the book for you. The story is intense and heart wrenching, the themes are intriguing and the ending is epic. Like every book I've read in this series, the final showdown left me chuckling with satisfaction. Read it. I got this book from the publisher in exchange for an honest review. What about your favourites - any mystery series you'd recommend? Amrit - Hope you do, I'm sure you'll like it! This series sounds really good, Priya. I"ll look out for the first book now. Priya! I've nominated your blog for the sunshine award. Seems quite interesting. Another series to put on my summer reading list.